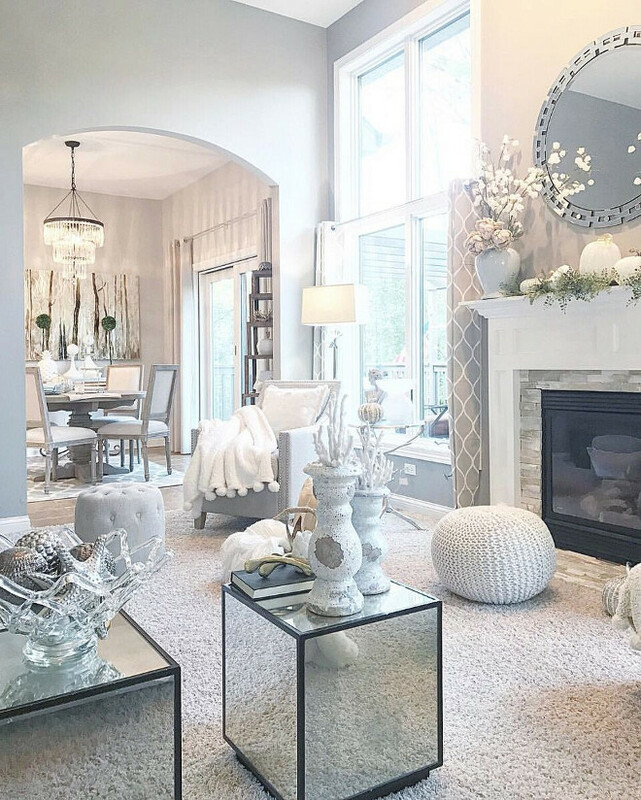 I feel that it’s incredibly necessary that we all do our best to make the best of where we live and one of the most important facts about this popular series on Home Bunch is that every home featured on “Beautiful Homes of Instagram” was decorated by the homeowner. 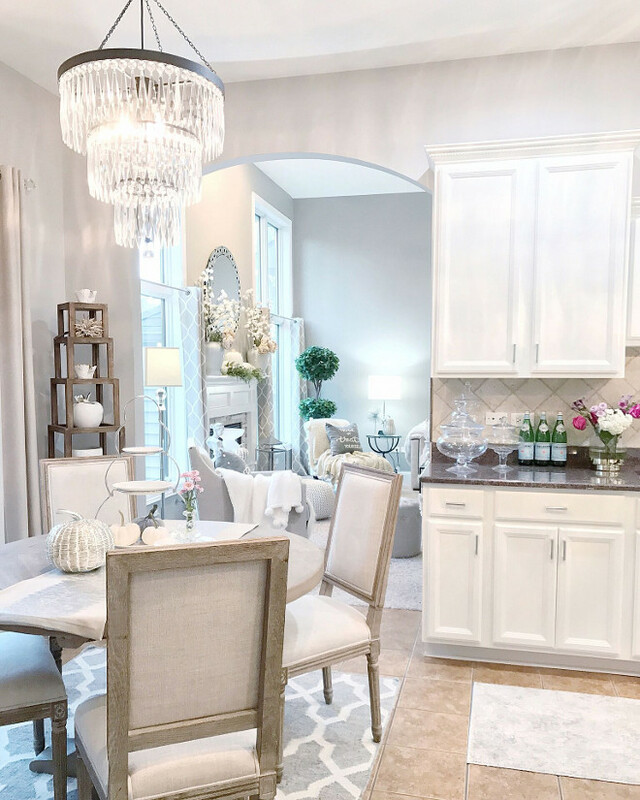 They chose the paint colors, the lighting, the decor and everything that you see. Today I am honored and very happy to be sharing Nan’s home, from @nanlindy. As you will see here, her home is one of those places you walk by and you notice how everything is so well taken care of. Pride and love is evident in the interiors as it is on the exterior. 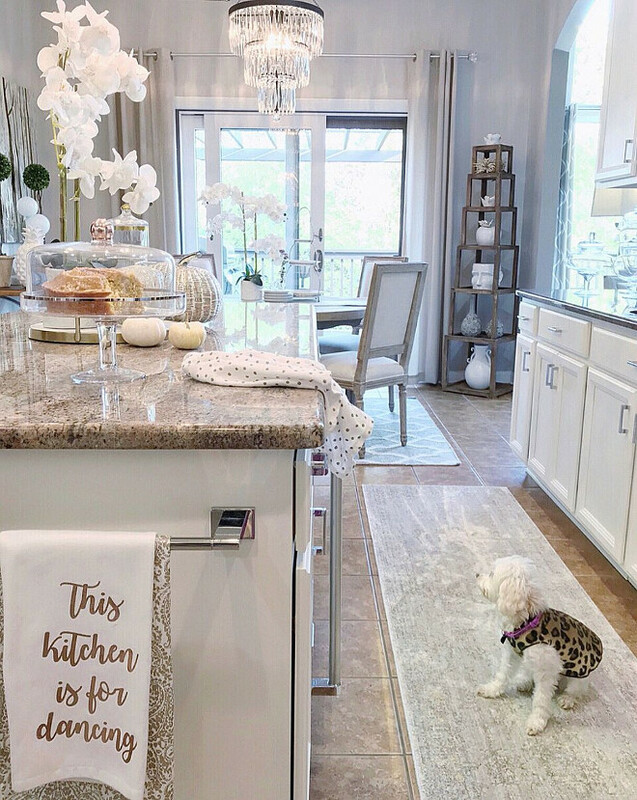 Get to know more about the homeowner and make sure to follow her on instagram. You can’t help but fall in love with her approachable style. 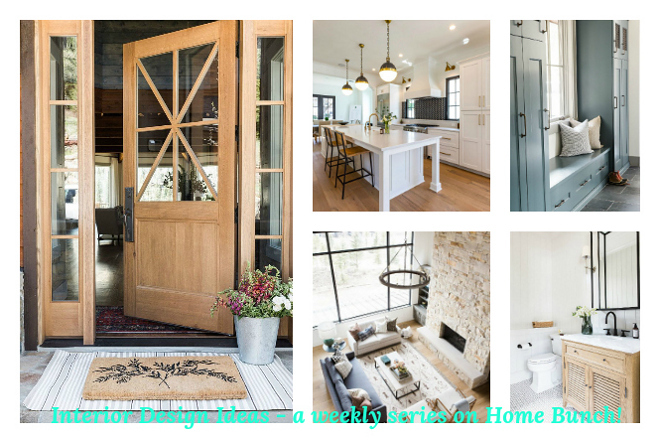 “I am beyond excited and deeply humbled to be featured this month as part of “Beautiful Homes of Instagram”. To be honest, I’m still in shock that I was extended the invite. 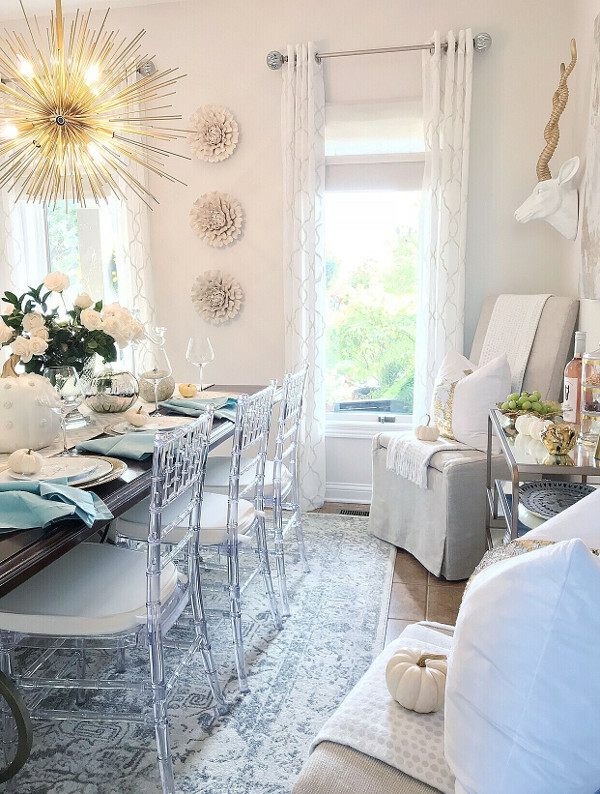 I wanted to make this feature reflect the love that we have for our home, because I’m a true believer that your home is a reflection of you, your family, and your personal style. We have lived in our home for 3 years. 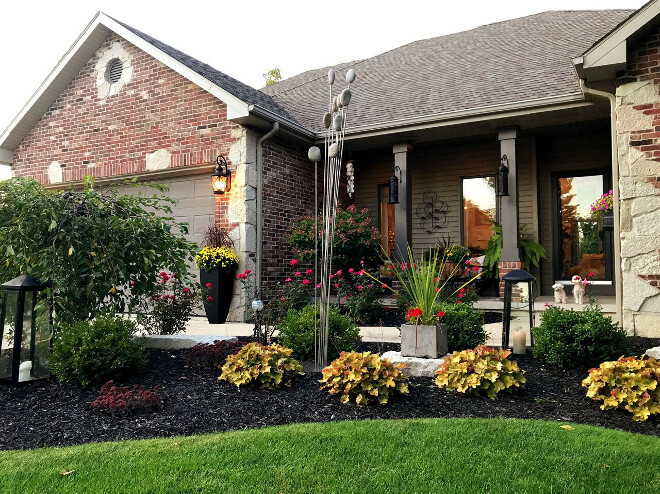 This 4 Bedroom, 3 full Bath, 4,000 sq ft brick, stone and vinyl siding, walk out ranch was built in 2007. 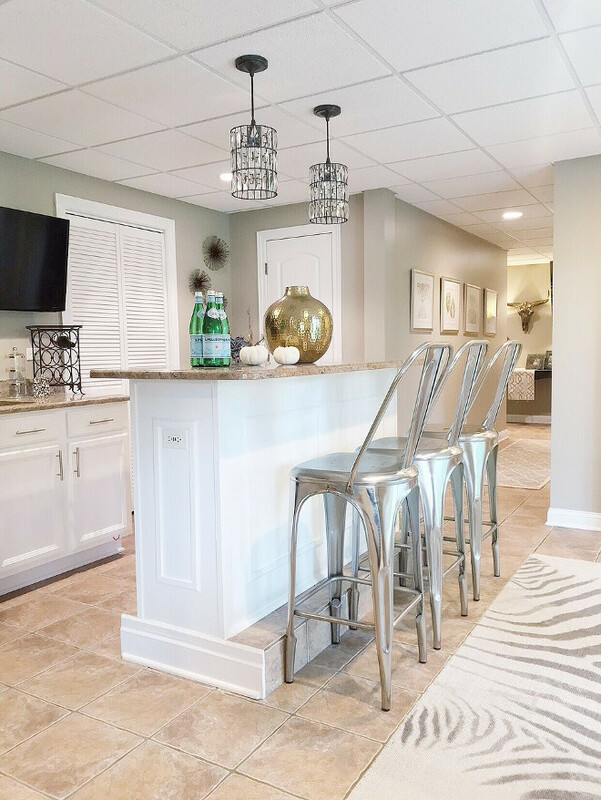 Although we did not build this house, the original owners and designer of the home truly utilized the space which includes a nearly 2000 square foot lower level with a walk out onto a 44 foot concrete patio and 44 foot deck above that is assessable from the master bedroom. 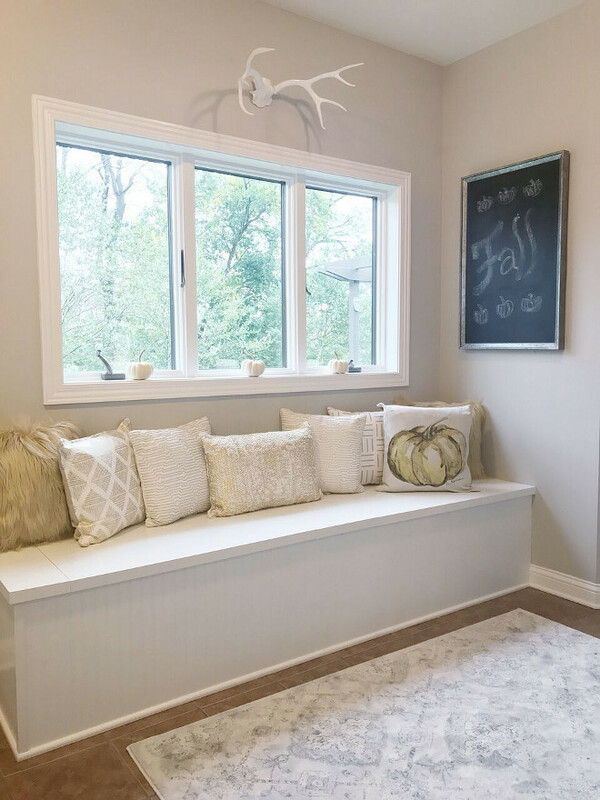 One of the best features of the home is the spacious laundry room/ mud room and living room with tall windows that let in tons of natural light. We changed a lot of the features of the home to reflect our own taste and style. 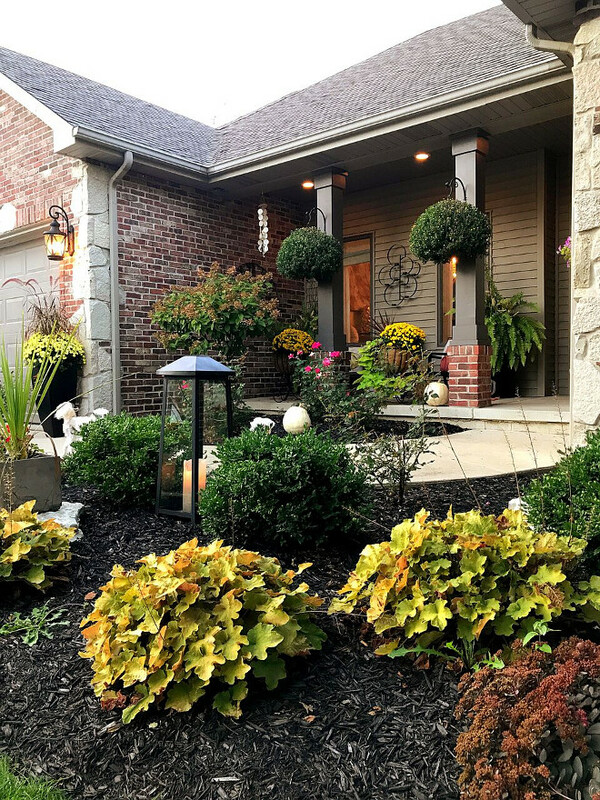 We started with changing the front yard landscaping. We painted the entire interior wall colors and changed all lighting. Our most recent update was the kitchen cabinet update and installing statement lighting. We are still finding ways everyday to make our house a wonderful space for our family. One that exemplifies beauty, comfort, and style. 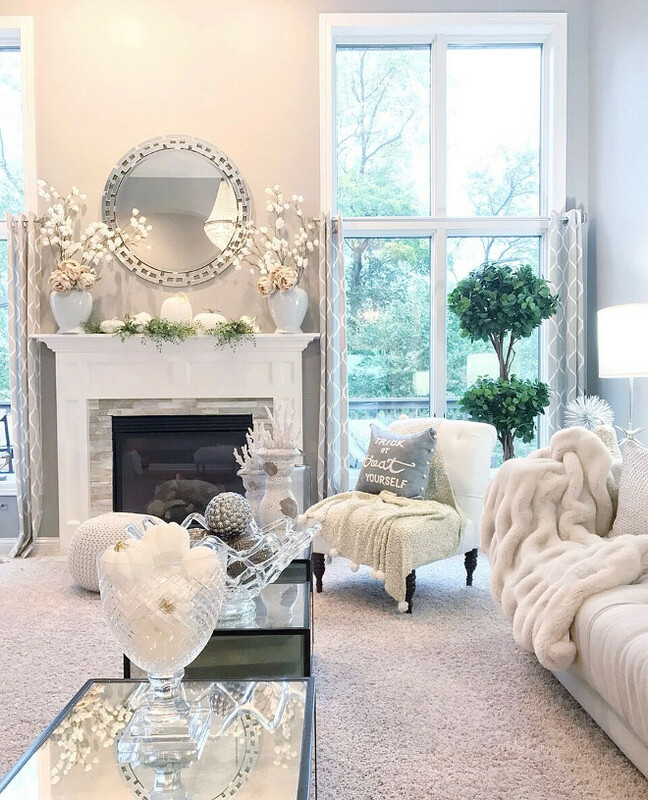 For those who have known me, interior design and decor have been a love and passion of mine for years! 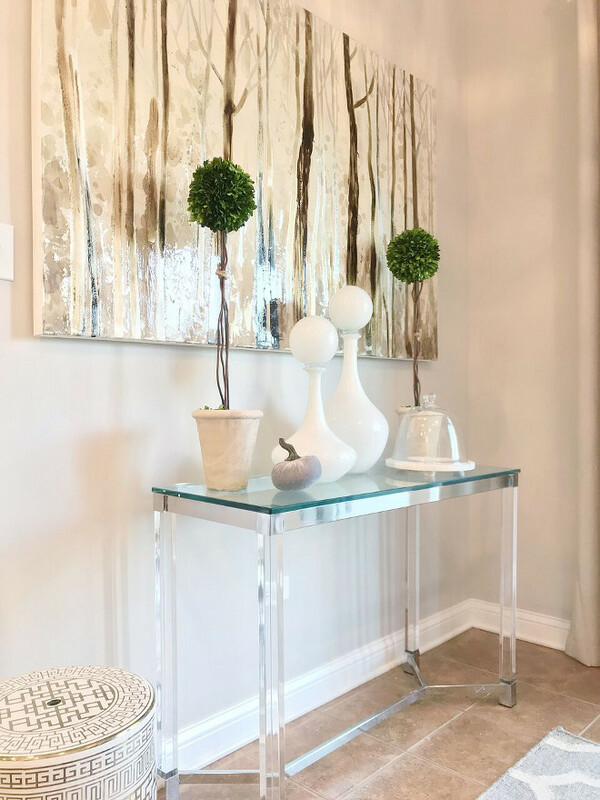 I want to represent that the beauty of decor doesn’t mean having the best of everything, but making the best of everything you have and making subtle changes along the way. Nan’s home is truly inspiring. Notice that even her front yard is decorated. 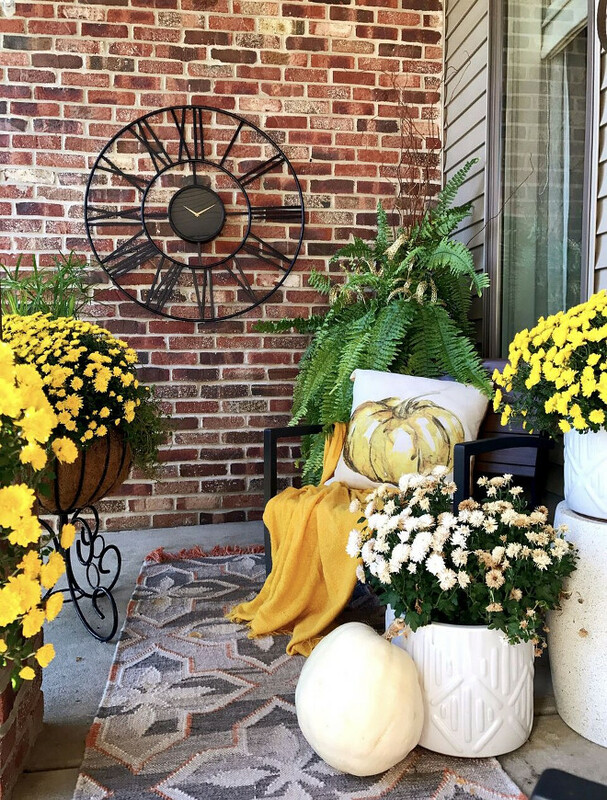 Mums and white pumpkins add beauty to her front porch. Nan is happily married to her hubby Daryl and they have two kids and two fur babies. Welcome to their beautiful home! Paint color is Sherwin Williams Functional Grey. 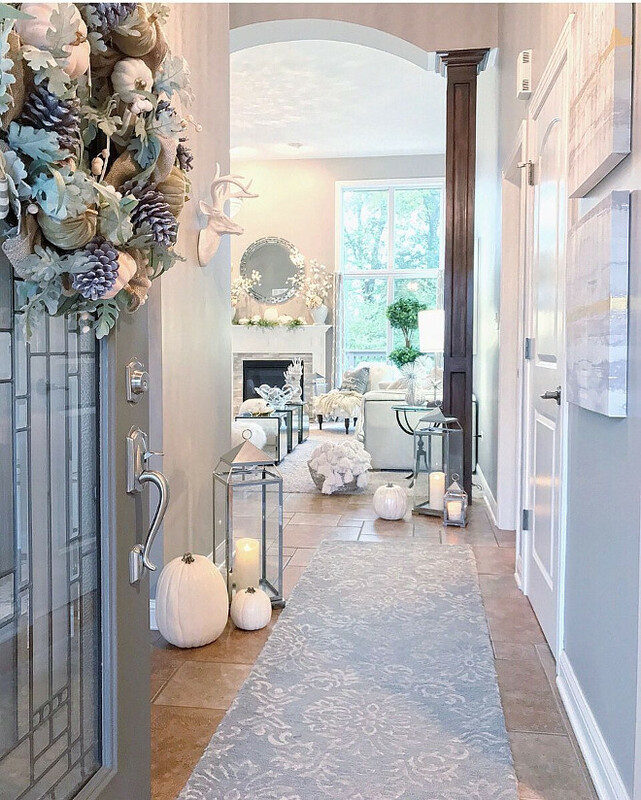 Foyer Runner – Pottery Barn – similar can be found here & here. Stag – Local Home Decor store. The living room is one of my favorite rooms in this house. 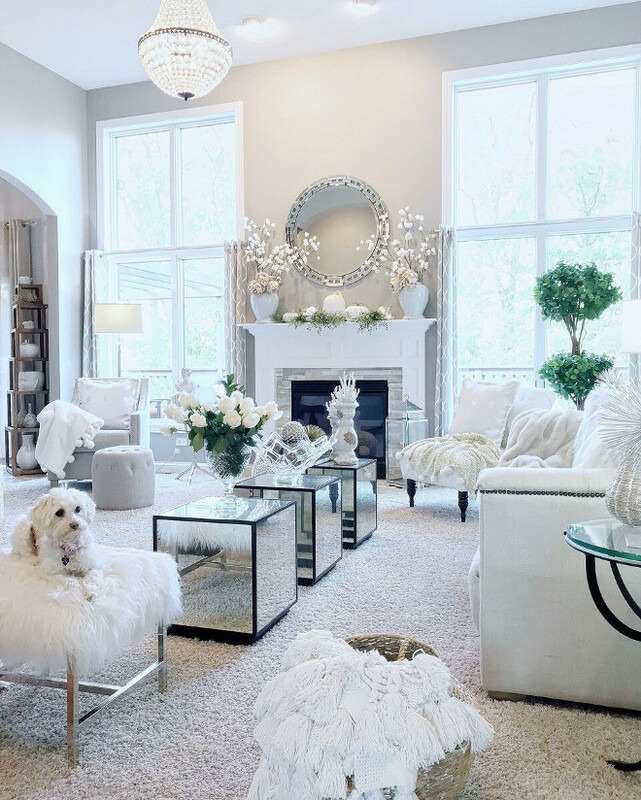 I love the decor and that adorable puppy! 🙂 Paint color is Sherwin Williams Functional Grey. Living Room Chandelier – Pottery Barn. Faux Fur Pillows: Loloi or PB Teen. 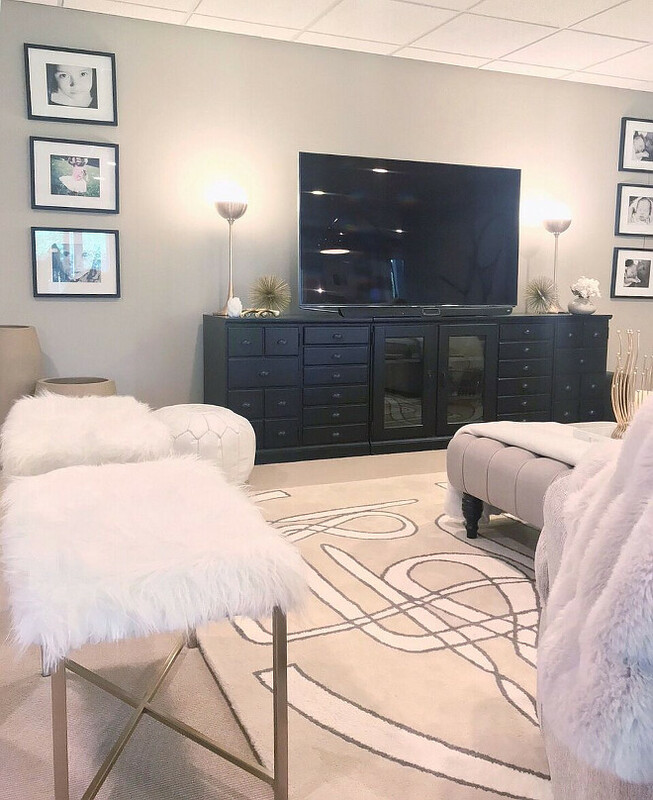 Fur Throw – Restoration Hardware – similar here. 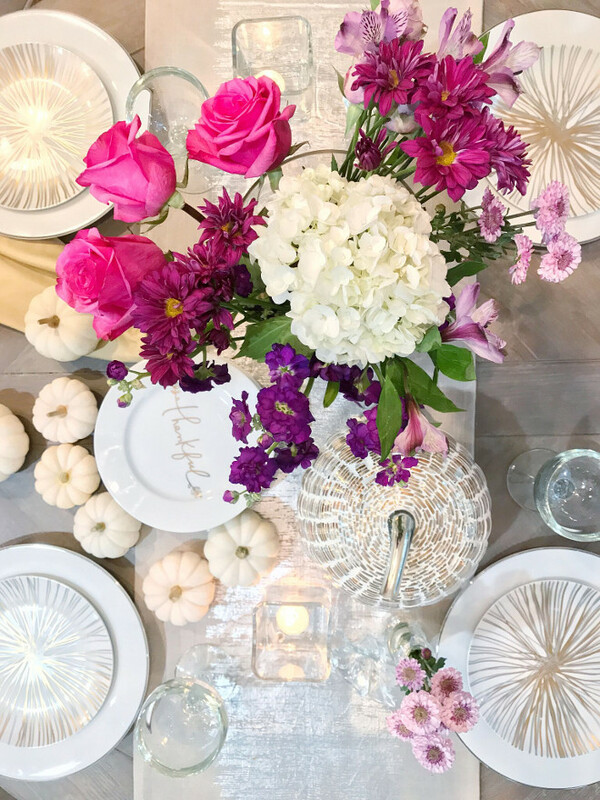 Glass Vase – Pottery Barn. 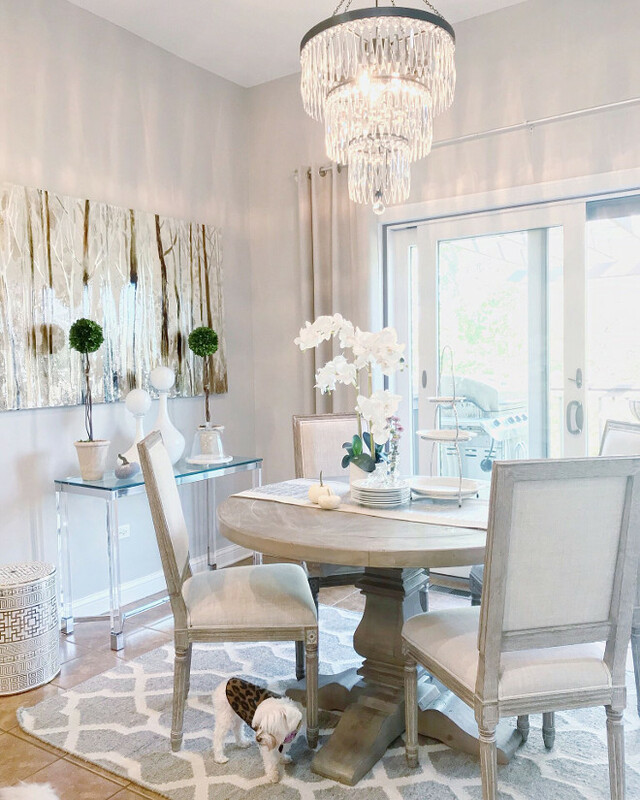 Mirror is from Z Gallerie. 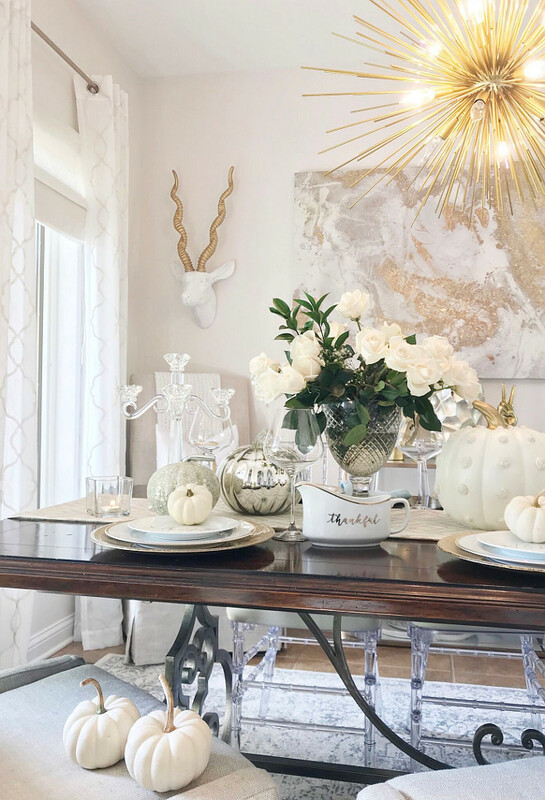 Temple jars on mantel & Faux White Pumpkins– HomeGoods. 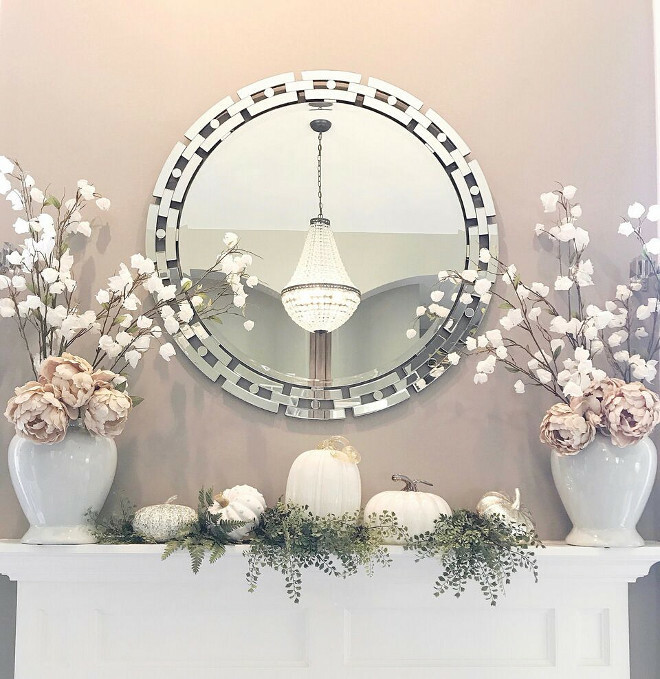 Greenery on Mantel – Local Home Decor store. 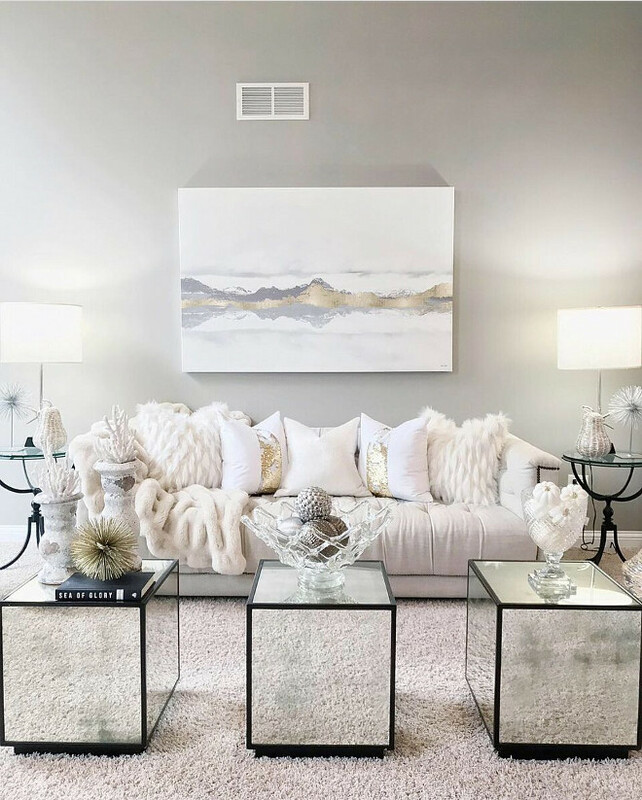 White Pouf – HomeGoods – similar here. 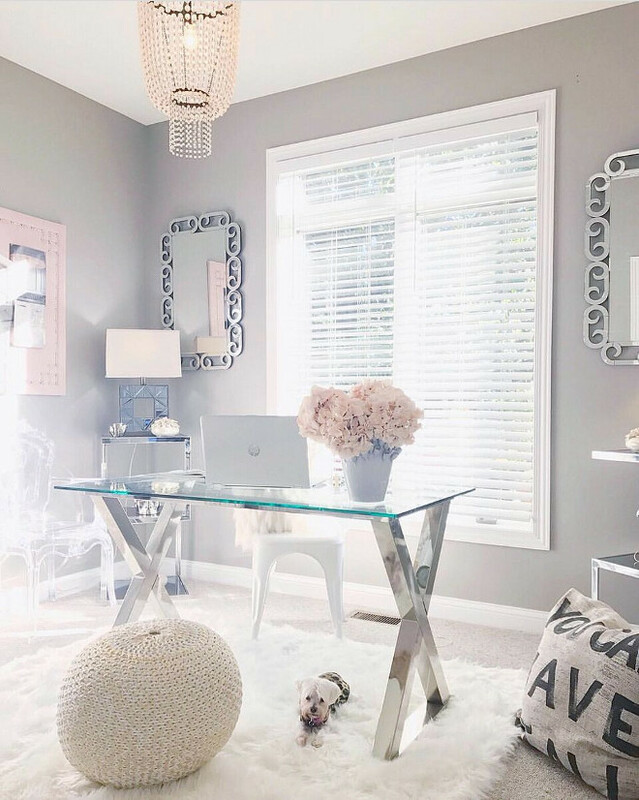 Grey side chair – HomeGoods – similar can be found here. 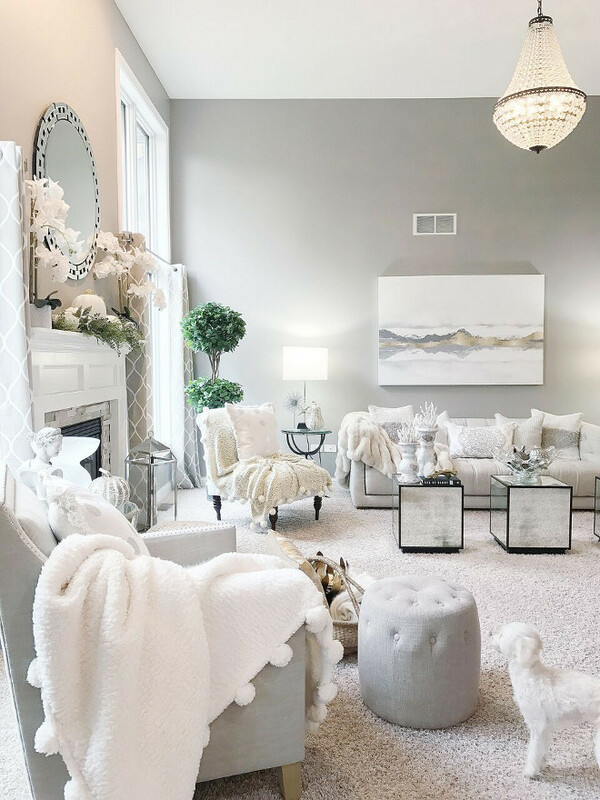 Pom Pom Throw: Pottery Barn. “Trick or Treat Yourself” Pillow – Pottery Barn. Grey stool – Pottery Barn. The living room opens to an inviting dining room with linen slipcovered dining chairs. 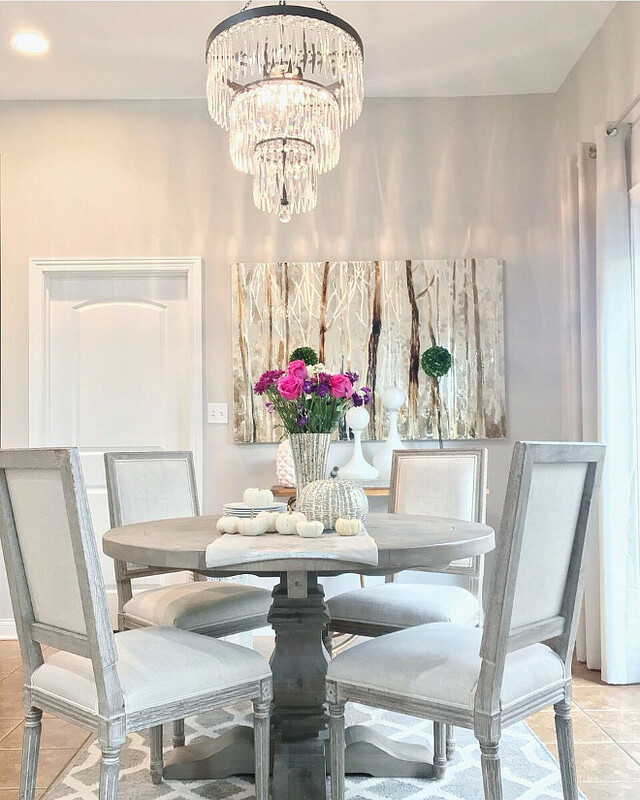 Linen Chairs – Restoration Hardware – similar here. Paint color is “Sherwin Williams Incredible White”. 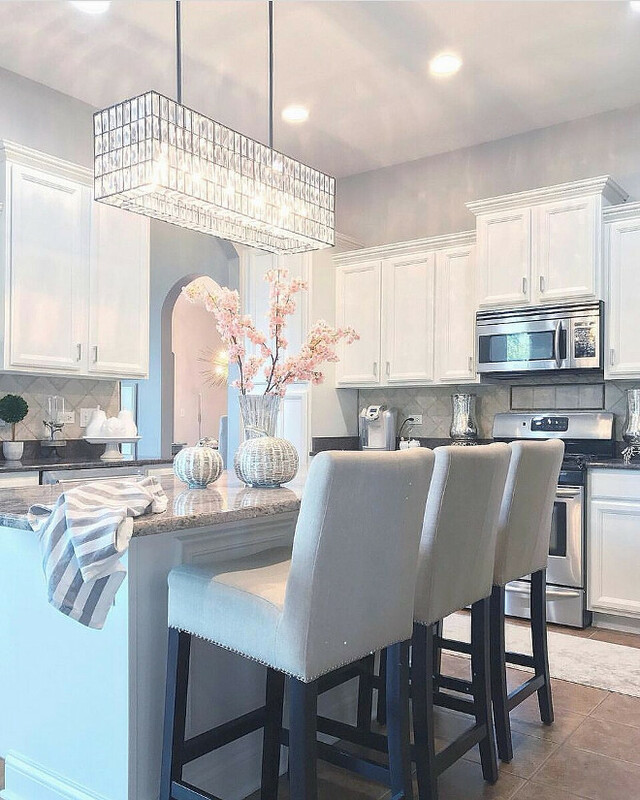 This kitchen was well-planed and it’s perfect for family life. 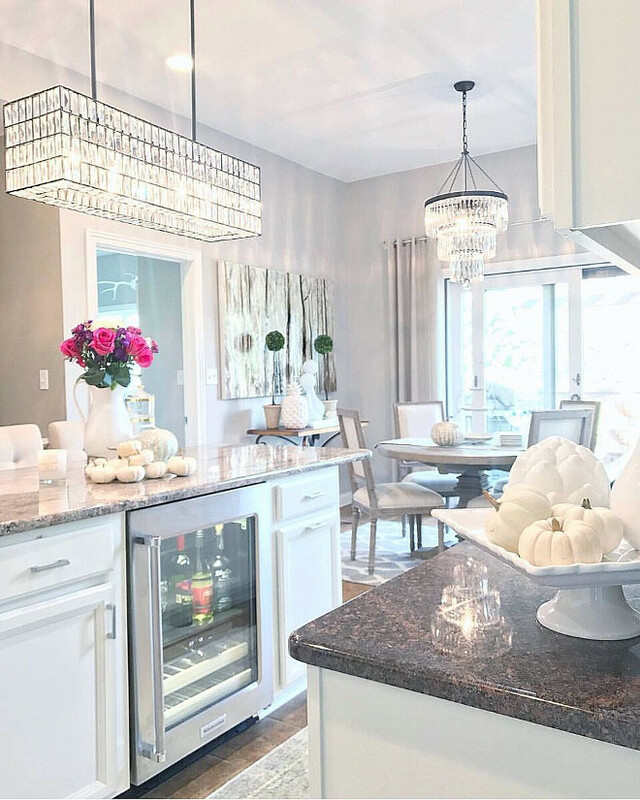 Cabinet paint color is “Simply White” by Benjamin Moore. 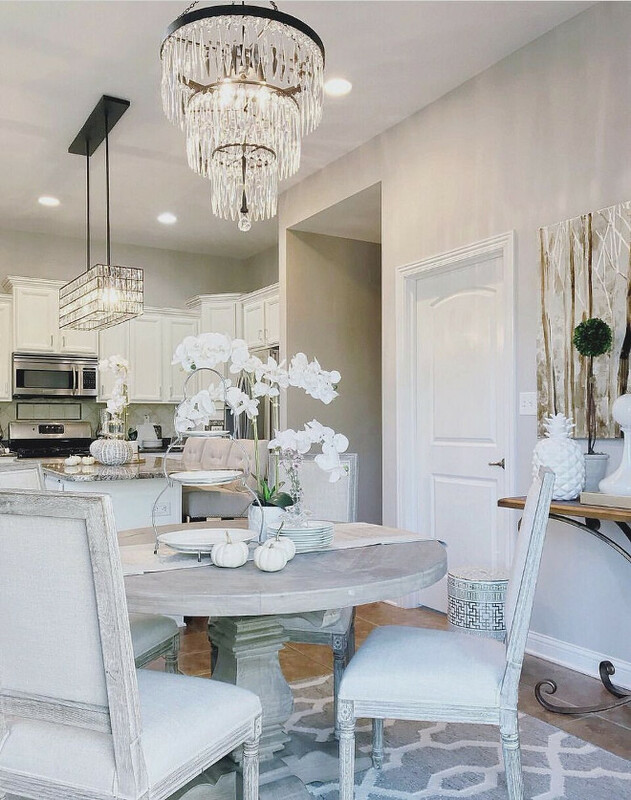 The breakfast room chandelier is from Pottery Barn. 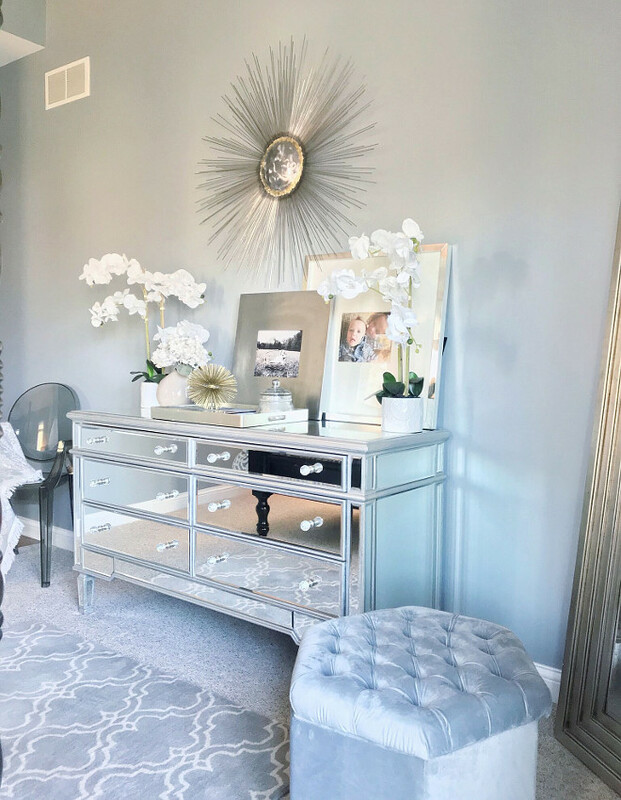 Rug – Restoration Hardware – similar here. Seeing this just bring happiness to my heart! Nan really knows how to add beauty to every room! “Thankful” plates are from Crate & Barrel. Square Back Dining Chairs – Restoration Hardware – similar can be found here. Round Pedestal Dining Table – Restoration Hardware – similar can be found here and here. 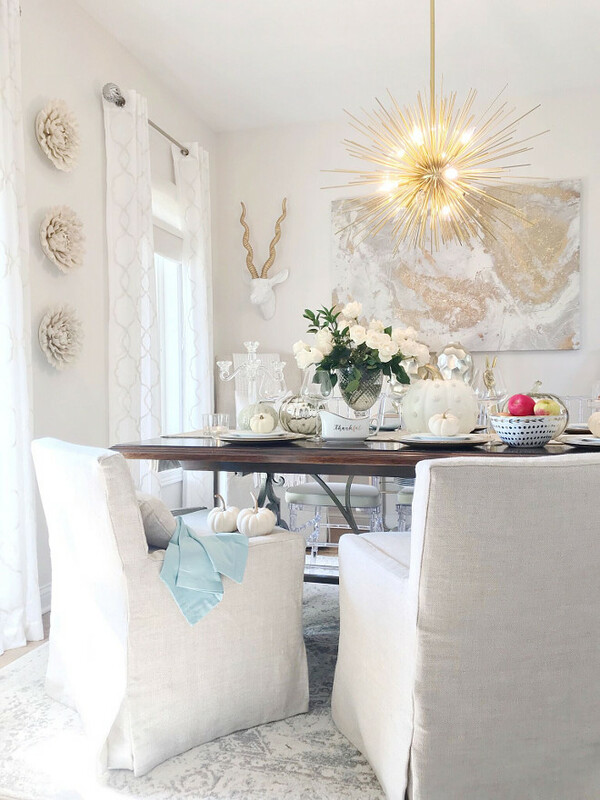 An acrylic and glass console table adds a light and chic feel to this breakfast nook. Paint color is Alpaca by Sherwin Williams. Paint color is Sherwin Williams Functional Grey SW 7024. 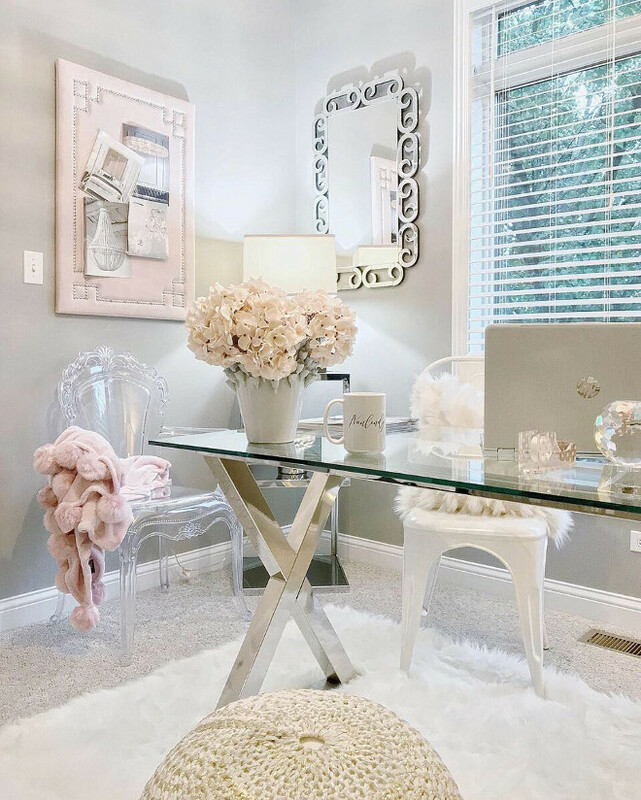 I am loving the grey and blush pink color scheme of this home office. 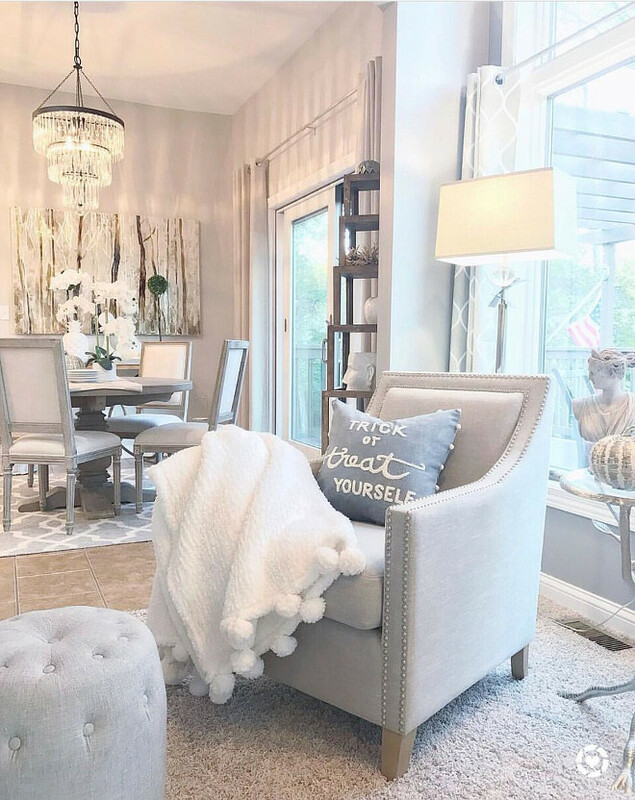 Similar Light Pink Pom Pom Throw can be found here. The master bedroom is full of beautiful ideas. Paint color is Sherwin Williams “Network Grey” SW 7073. 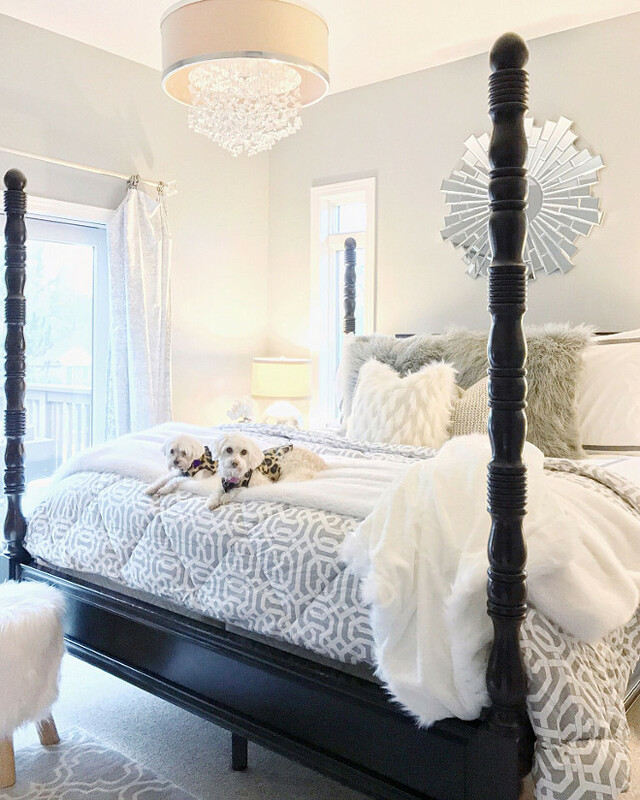 Large White Throw – Restoration Hardware – similar here. 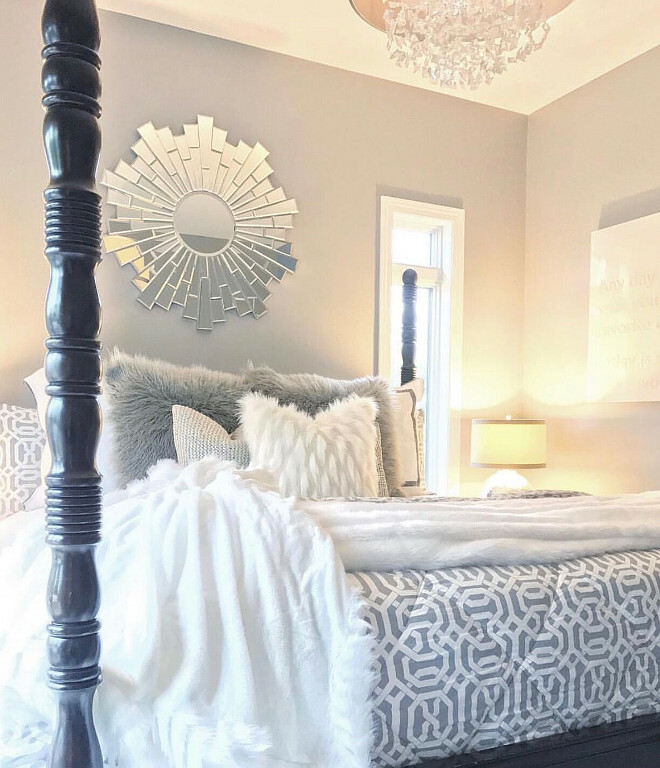 Large Grey Mohair Pillows – Pottery Barn. Mongolian Faux Fur Stool – Pottery Barn. The mirrored dresser is Joss & Main. 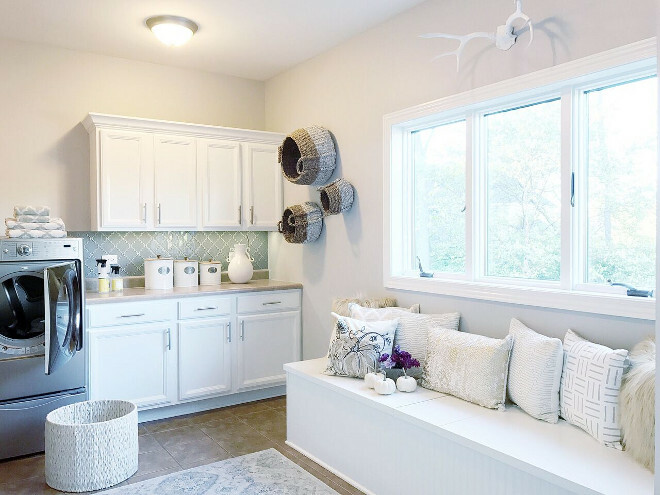 A neutral paint color brings a sense of peacefulness to this laundry room. 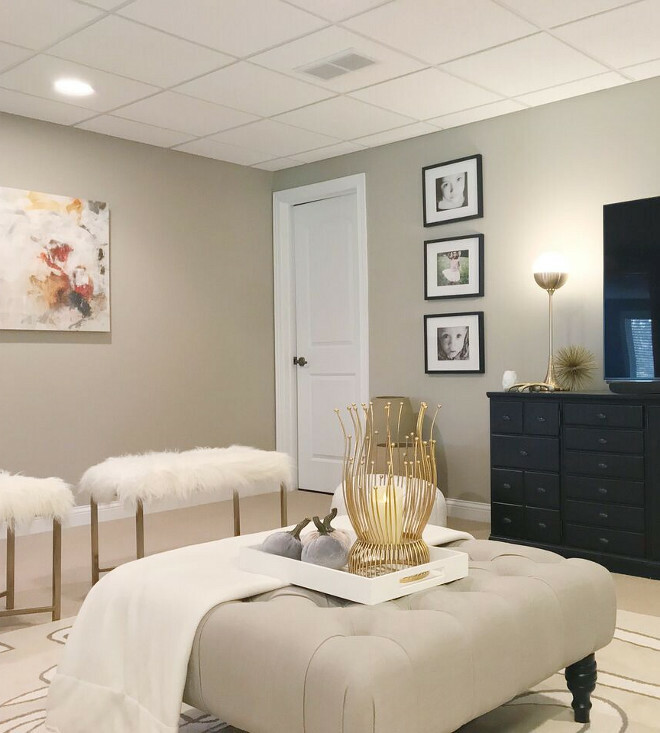 Wall Color –“Balanced Beige” by Sherwin Williams. I am really loving Nan’s basement! It’s perfect to entertain or just curl-up and watch a good movie. 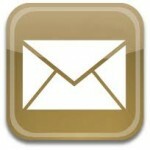 Paint Color: Balanced Beige by Sherwin Williams. 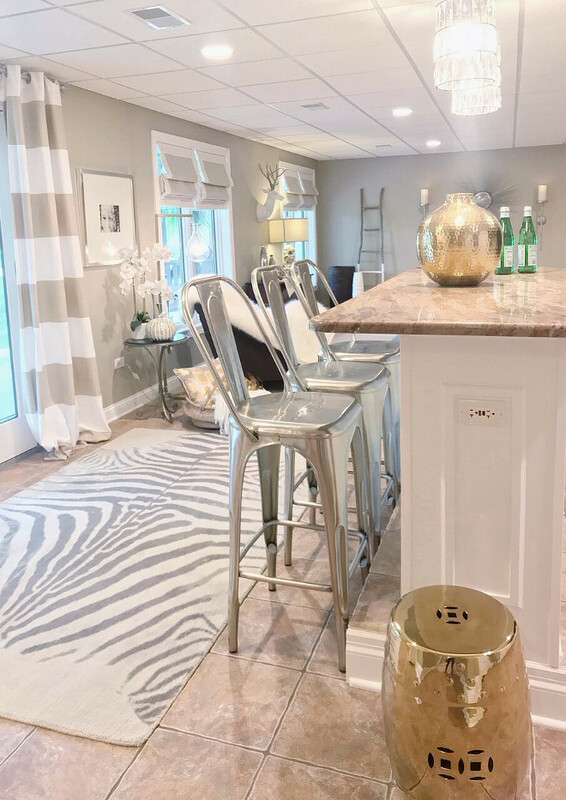 The zebra rug is from Pottery Barn. 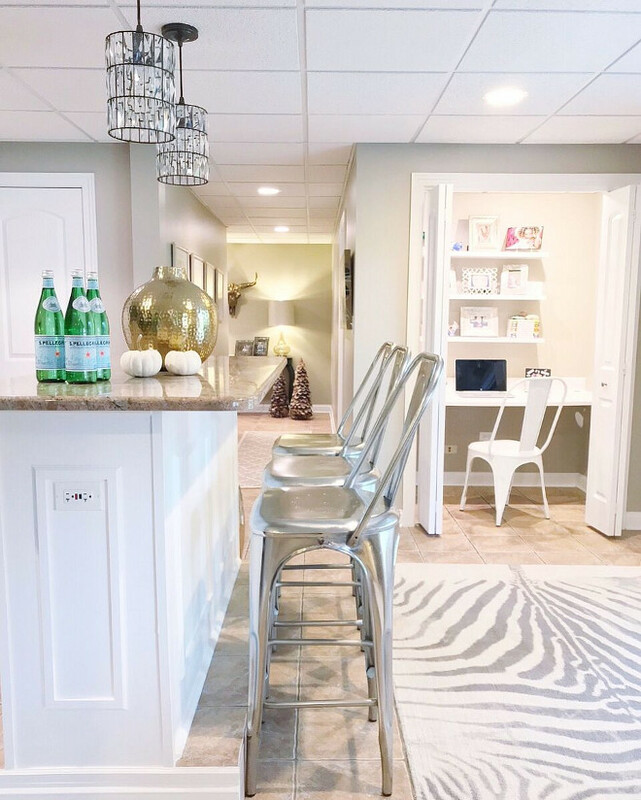 Chrome Barstools – Restoration Hardware – similar here. 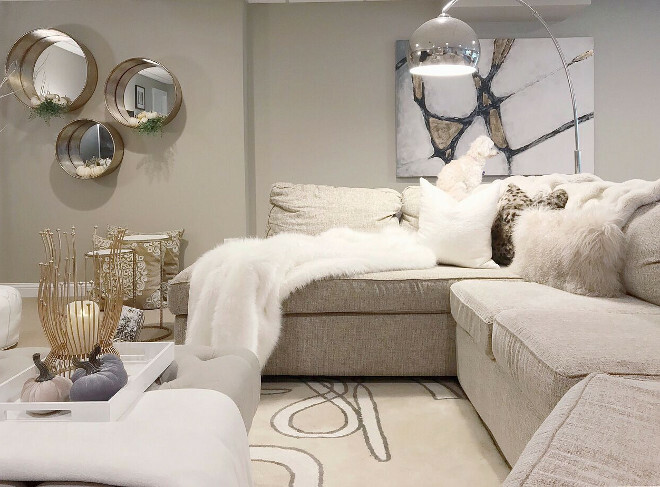 A ottoman coffee table and faux fur & brass benches bring some softness to this family room. Similar faux fur & brass stools & benches: here, here, here & here. 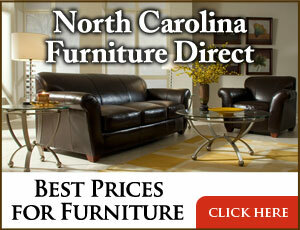 Sectional – Walter E. Smithe Furniture. 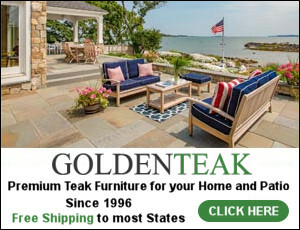 Sectional Lamp – Pottery Barn. Rug – Crate & Barrel. You can shop Nan’t home here.